Put it like this: it's not easy to completely redesign an icon, even from the inside. Next month at Detroit will see the debut of the . 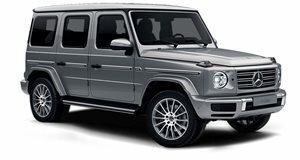 It’s a pretty big deal considering the existing G-Class has been around since 1979. The iconic SUV’s first complete redesign will see it become a more user-friendly SUV without, hopefully, sacrificing any off-roading prowess. In the lead up to Detroit, Mercedes-Benz has released the first official images of the interior and, yeah, it looks great. It’s an ideal blend of luxury with an SUV-ish feel. Mercedes describes the look as “a contemporary interpretation of a legend…with clear, geometric lines…and styling elements from the exterior transposed into the interior.” Take a look at the air vents on either side or the shape of the loudspeakers; both are reflected from exterior design bits, specifically the round headlamps and rectangular turn signals, respectively. Also take note of the familiar grab handle in front of the front passenger. There are also chrome-highlighted switches for the differential locks. Of course, there’s a full infotainment system in place, allowing drivers to control it without taking their hands off the wheel thanks to a touchpad on the center column. We’re liking the nicely laid-out instrument panel as well. Mercedes says it features “timeless tube-look analogue dials.” There are two 12.3-inch display screens drivers can configure with three different styles, Classic, Sport and Progressive, according to preference. Like any Mercedes interior, the sports nothing but high quality materials and, seemingly, excellent fit and finish. Drivers will also enjoy greater visibility out the front glass compared to the outgoing model. Along with increased passenger space front and rear, rear seats that can fold 60/40 or 100 percent, the 2019 G-Class, at least interior wise, looks like a winner. No longer will passengers, specifically rear seat occupants, be stuck with an awkward seating position thanks to the vehicle’s military roots. That’s gone now, replaced by luxury and proper comfort. We’ll get our first look at the 2019 Mercedes-Benz G-Class in the flesh in a few weeks at Detroit.